Research conducted last year showed that many horse owners struggle to recognise some of the signs of laminitis. The study found 45% of owners were unable to recognise their horses were suffering from the disease, resulting in them going undiagnosed and untreated. Our understanding of the causes of laminitis has improved dramatically in recent years. Historically it was always thought that access to lush grass was the main cause, but we now know this not to be true. The most common cause of laminitis is an underlying hormone condition. Cushing’s disease, Equine Metabolic Syndrome and insulin resistance are all conditions known to increase the risk of a horse developing laminitis. 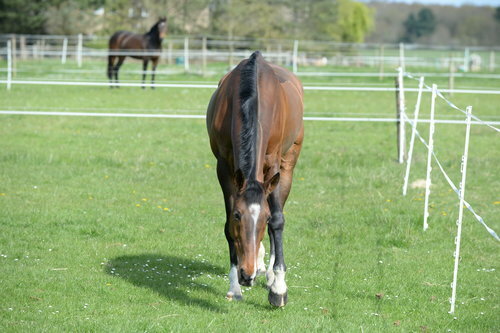 These conditions make it harder for horses to break down sugars in their diet, so foods high in sugar, such as sweet spring grass, can trigger laminitis. Overload laminitis is rare but usually occurs following serious injury/fracture to a leg. The horse then overloads the good leg to avoid weight bearing on the injured leg. This excessive weight bearing can trigger the onset of laminitis in the non-injured leg. Laminitis can occur in critically ill horses due to severe infection or septic illness. Fortunately this represents a minority of cases. Stiff or stilted gait, especially when going from soft to hard ground. Divergent hoof rings (spacing between growth rings is wider at the heel than at the toe), hoof cracks, bruising or blood in the white line. To find out more about laminitis, read the full article in issue 450, available here.